AHC’s 1st Quarter Webinar to Discuss ELD Mandate – The American Horse Council (AHC) will host its 1st Quarter 2018 webinar on Monday, February 12th at 12:00 PST (3:00 pm ET) and will address the recent Electronic Logging Device (ELD) Mandate that has caused much confusion and a lot of questions throughout the equine industry. Note: this webinar is now full. We will share the link to view the recorded webinar as soon as it is available to this location. – NW Equine. Click to view the Facebook Event page for this AHC Webinar. What can you do? Even if you are currently exempt we ALL need YOUR horseman’s VOICE! These regulations some new, some established, some multi-level and confusing, are now being enforced, they are not written with the horseman in-mind. Example – Hours of service rules indicate that when driving you can drive for 11 hours in a 14 hour period, and you must, after 8 consecutive hours, take a 30 minute break. At the end of your day (14 hrs), you’re required to take a 10 hour break. Creating this scenario: You leave the barn at 5:00 am with your dually and 3 horse w/living quarters to attend an event (CVWR over 26,001). Drive 2.5 hrs to event venue, unload, tack up, warm-up and wait. Compete throughout the day with the intent of winning money and/or collect payment (splitting fuel costs to haul a friend) you are considered a CMV (Commercial Motor Vehicle. Yes, what the IRS considers a hobby the FMCSA considers ‘commerce’. See info graph below.) Load up and be on your way by 5:00 pm. Should be back at the barn about 7:30 pm. The problem? Your 14 hour driving window stops at 7:00 pm. If you keep driving, you broke the rules, can be fined, and your EDL records those details. This is just one of the regulations, some with several components, that is not practical in the equine industry. Get involved and let your voice be heard, there are several lobbying groups working on this issue. You and/or the horseman groups that you affiliate with can help insure that the horseman’s voice is heard. What is the GVWR (Gross Vehicle Weight Rating) of your tow vehicle. Is the maximum operating weight/mass of a vehicle as specified by the manufacturer including the vehicle’s chassis, body, engine, engine fluids, fuel, accessories, driver, passengers and cargo. Check label inside drivers door. Example GVWR – 2012 GMC 1-ton dually is 12,000 lbs. – 1994 GMC 1-ton dually is 10,000 lbs. 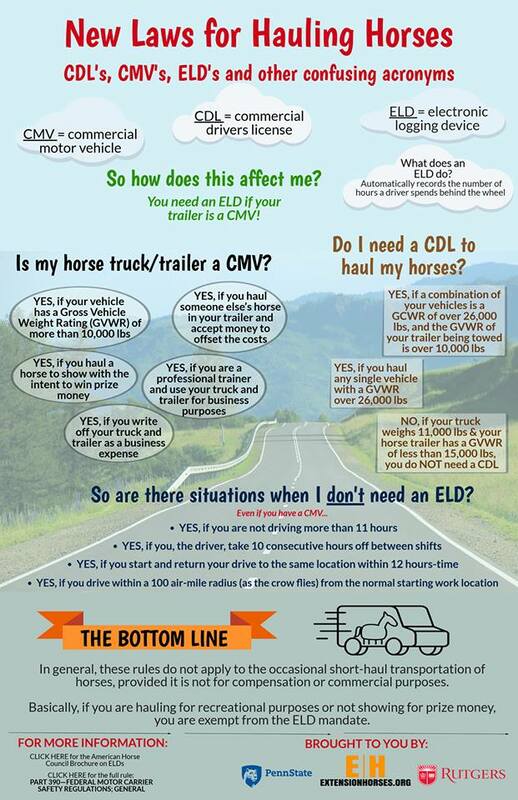 What is the GVWR of your horse trailer. Check label under gooseneck drivers side, on frame, or in tack room. 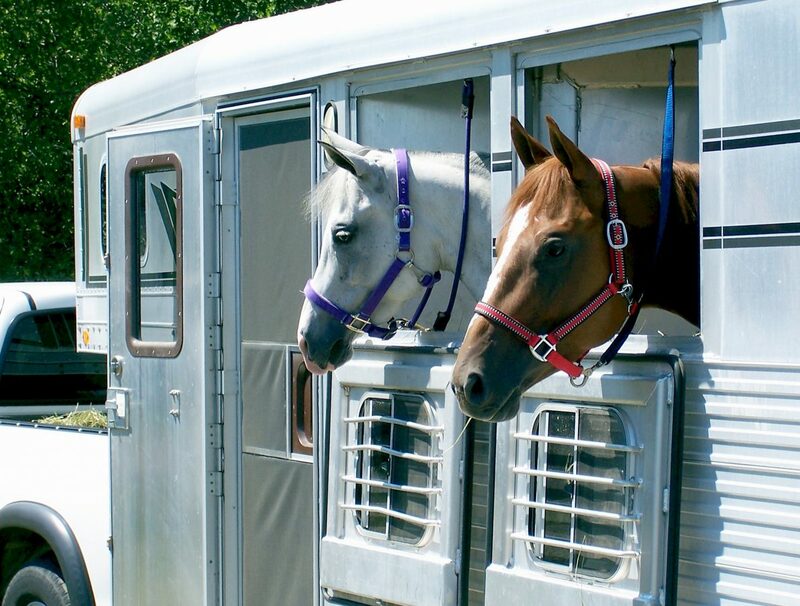 GVWR refers to the value assigned by the trailer manufacturer which reflects the recommended maximum loaded weight for a particular horse trailer. Included in this rating is the weight of the horse trailer itself plus the weight of everything else you’re carrying in the trailer, that is, horses, and gear. Example – 2018 Featherlite 3 horse w/11′ living quarters GVWR 16,000 lbs. – 2015 Featherlite 3 horse w/tack room 10,400 lbs. – 2016 Trails West 3 horse w/tack room 12,000 lbs. Is your combined GVWR over 26,001 lbs? If so, you need a CDL. ELD and CDL AHC Brochures, click to view. How has the AHC been addressing this issue, click to view. Tri-State Livestock news article, giving good points. Protect The Harvest article, with more points.